DUBUQUE, Iowa At a rally this morning in New Hampshire, I asked a senior Mitt Romney campaign adviser what the campaign had planned in the final crucial days. His answer was swift. He said it with a smile and a laugh, but it also carried an understandable and inevitable tension, which is visible not only among top campaign staff, but even with the candidate's wife herself. Delivering a basket of baked goods to the press on the campaign plane this morning before takeoff for Iowa, Ann Romney -- normally relentlessly sunny and confident -- appeared emotional, almost vulnerable, as she reminisced about the all consuming campaign and reflected on its uncertain closing days. "It's been a long road," she said. "It's very touching for me. It was very emotional when I gave my last sort of address by myself, because I hear the voices and passion of the people out there that are really hurting, and they are etched in my mind and my heart, as they are with Mitt." With three days left in a race that could not be closer, Romney will be hitting seven states between now and Tuesday in an effort to close the deal. But among campaign officials, there also is the realization the race now is out of their hands and that it remains closer than they had hoped a week ago. 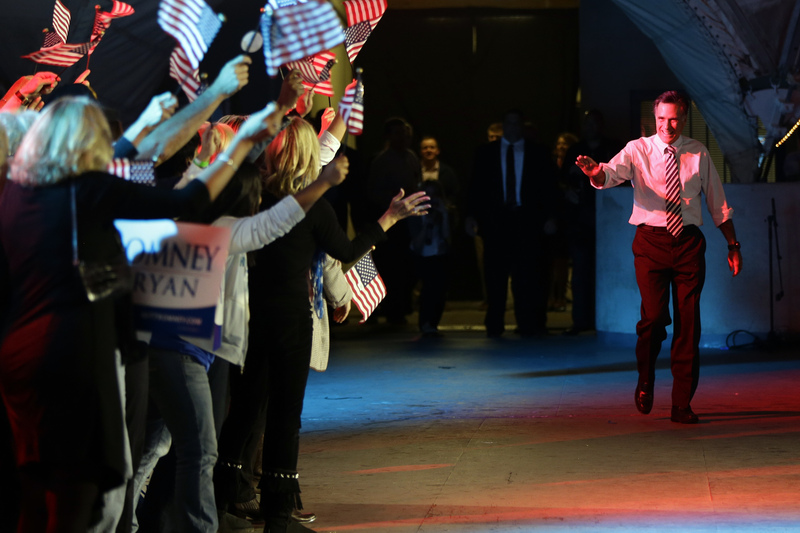 Campaign sources concede superstorm Sandy stalled Romney's momentum. For eight straight days, polls showed him picking up support. The campaign's internal polling, which is using different turnout models than most public polls, had him on solid ground in Florida, Virginia, North Carolina and Iowa. He had a slight lead or was tied in Ohio, New Hampshire and Wisconsin and was in striking distance in Pennsylvania, a state Republicans hadn't won since Ronald Reagan in 1984. Coming off the pivotal first debate, the campaign pushed the message that the 2008 Barack Obama of hope and change had become the 2012 President Obama of divide and destroy, making the campaign about small things -- Big Bird and binders -- at a time the nation had big challenges. It resonated with voters in those swing states. But then came something very big: a natural disaster that left a path of death and destruction on the East Coast. Suddenly, there was little talk about small things. Those leads in Florida, Virginia, North Carolina and Iowa still hold in the internal polls, campaign sources say, but Romney's movement flattened out or, as the campaign likes to say, "paused." Nevada is now off the table, and those neck-and-neck swing states are even tighter. Publicly, in these tough final days, the campaign is still projecting confidence: confidence in their candidate, their polling and their chances on Election Day. They have some reasons for cautious optimism: Polls show Romney winning among independents, a shift away from the president in 2008. The polls also give Romney the edge on voter enthusiasm and intensity, key indicators of turnout, which is what will decide this election. If voters turn out for Mr. Obama as in 2008, he wins. If turnout is closer to 2004, or between 2004 and 2008, as the Romney campaign is banking on, the president is in big trouble. Romney's advisers know it's now anyone's guess. "A knife fight in the phone booth," is a phrase you hear a lot. One adviser this morning was even more candid: "I'm not saying (Mr. Obama) is definitely going to lose." But the advisers see comparable concern and tension in the Obama campaign, for all of its own outward displays of confidence. "We're the challengers. We always knew we could lose," one aide told me here in Dubuque. "They never contemplated they could lose." With New York and New Jersey reeling from Sandy and the extent of the damage unknown, the president on Thursday went back on the campaign trail to Colorado and Ohio. That surprised top Romney advisers, who had expected Mr. Obama to remain in the White House another day, to take the high ground and continue to look presidential while dealing with the disaster -- a move that also would have forced Romney into the inferior position of solitary campaigner. Their decision to instead hit the campaign trail, the Romney advisers believe, are clear signs the Obama campaign knows it has to try to protect its flank. This week, the Obama campaign sent its most valuable surrogate, former President Bill Clinton, on an aggressive campaign swing, leveling harsh attacks on Romney, even as the White House said Mr. Obama was suspending his own campaigning because of the storm. Monday will bring another indication it's the knife fight in a phone booth. Mr. Clinton will spend the day campaigning in a state no one would have predicted a month ago: Pennsylvania. And one of the three cities reportedly on Mr. Clinton's swing through the state? Vice President Biden's hometown of Scranton.